These versatile pieces bring you plentiful storage, in your dining room, living room, and more. 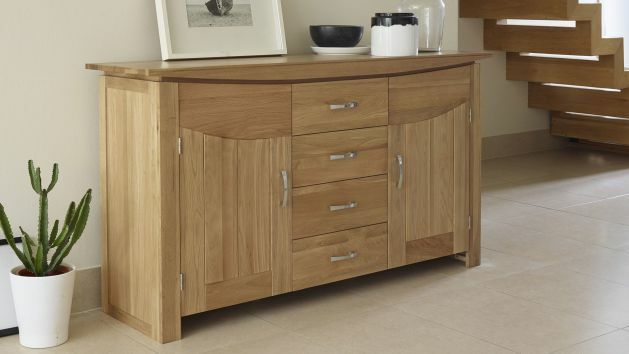 Our large sideboards are made of 100% solid hardwood throughout. Our large sideboards have been designed to offer you lots of versatile storage, whether you use them in the dining room, living room, hallway or more. With drawers and cupboards, as well as a beautiful solid hardwood top, they're a great way to store and display your favourite belongings. The ultimate in space saving storage facilities, our long sideboards are constructed to meet our incredibly high quality. We used only 100% real hardwood in our sideboards, available in a variety of finishes to match our more than 20 different ranges of furniture. Browse our selection of stunning rustic and natural solid oak large sideboards, as well as designs in exotic mango, painted styles, and more. With solid hardwood used throughout, including on the drawer bases, backs and drawers, and real dovetail joints, you know that by choosing one of our large sideboards, you are investing in furniture that will last a lifetime.